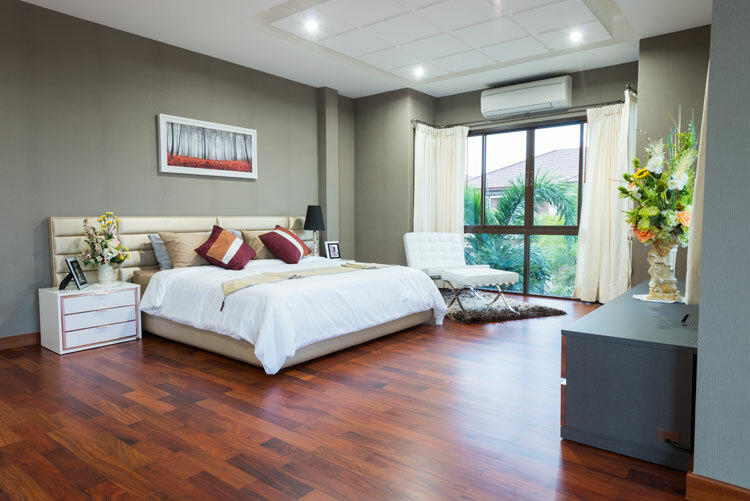 Hardwood floors are beautiful, durable, and can last for decades if they are properly maintained. Of course that is the issue isn’t it. The question everyone has but the answers may vary from floor to floor or location to location. Let’s say you have an issue arise that needs a professional to evaluate about moisture in a corner location. What if we told you that the majority of hardwood issues can be avoided before the first plank is installed by properly preparing the substrate. It is absolutely true. For purposes of this article, we will be discussing a glue-down installation of hardwood floors over concrete. While there are many other methods, such as pneumatic nailing and click-together planks, bring their own challenges which will not be addressed here. This article also does not address laminate or bamboo, although many of the same considerations apply, especially regarding moisture. These would be what we call Best Accepted Practices in our flooring industry. With over 30 years experience, there may be exceptions to our points of discussion, but by and large they are regarded as what to ask before you begin. Wood flooring adhesives are usually formulated for either dry environments or damp environments. The first question you may ask is what is the difference between a high-moisture slab and one that exhibits hydrostatic pressure, which is moisture being actively forced up through a concrete slab caused by a nearby pond or water source. If this may be your location there may be an issue we will need to come out to investigate a little more; as adhesive manufacturers recommend use in areas with hydrostatic pressure. Asking the right questions before you start is important to the finished product: Let’s take it from the beginning. Is my site ready to receive hardwood? Have you considered things like slope, drainage, gutters, and sprinkler systems that can contribute to moisture in the slab and can be properly taken care of by landscaping. Does my slab have a vapor barrier? By building code in your city, on-grade slabs should have a plastic moisture barrier and a drainage path beneath them to stop moisture intrusion. If your slab does and there are no obvious signs of seasonal moisture (white mineral deposits on the surface or dark coloration near walls, for example) then you can move on to the next step. If a moisture vapor barrier is not in place or if it is unknown, it’s worth considering applying an epoxy or polyurethane barrier to the concrete surface. Usually this involves shot-blasting the concrete, mixing and applying the moisture barrier, then using a self-leveling underlayment to make the substrate flat. This approach can also be used over newly poured concrete seven days old or older. How much moisture is in my slab? Here are the 2 most common tests for moisture that are conducted with pros and cons to each. Which one you should use is typically dictated by the flooring you will be applying and the adhesive you will be using. This moisture emission test is conducted by the procedure in ASTM F1869 and produces a number like 3 pounds in 1,000 square feet. A relative humidity test is conducted per ASTM F2170 and is listed as a percentage. Keith Clay believes that both of these will be useful and we can help you determine which adhesive to use. Normally these tests are conducted in three locations for the first 1,000 square feet to be covered, and one for every 1,000 feet after to give a roadmap of the slab. The accepted best practice in Adhesives for dry areas typically are in the 3 lbs./75% RH range while adhesives for damp areas could go a little higher. How do you know? Standard rule of thumb will say when the moisture exceeds the recommendations of the adhesive and the flooring being installed, a moisture barrier as described above will need to be installed prior to installation. Will you be specifying a specific hardwood? If so the answer to the questions about moisture barriers and moisture levels will help you determine what to specify. It will also help you use an epoxy or polyurethane moisture barrier, a self-leveling underlayment (including a primer) or both. In 30 years, we at Keith Clay Floors have determine that it is rare that a floor is ready for installation with just a bucket of glue and a trowel. Making a decision about which glue to use is typically determined by knowing what type of wood will be installed and the moisture level of the slab. In what condition is my slab? If you are unsure, then you need to call us for an inspection. Especially if this is a new home to you. Hardwood installations require flat, dense concrete that is level to a tolerance in plane of 3/16” in 10 feet or 1/8” in a 6-foot radius as a general rule. If that doesn’t describe your slab, or you don’t know, you may need to do some surface prep to prepare it. The most common approach is to cover what is there with a self-leveling underlayment. For high moisture situations the self-leveling underlayment or patch must be an exterior rated if a high-moisture adhesive is being used. However, care must be taken not to go over any active movement joints with the self-leveler. The self-leveling underlayment typically flows to a degree but must be tooled to be uniform across the entire area. In an ideal situation, there should be at least three people present when installing a self-leveler. Each person mixing, one person carrying the buckets and pouring out the mix and one person tooling and smoothing the self-leveler are pretty standard. It also helps to mark the desired height of the leveler on adjacent walls. HVAC and direct air-flow should to turned off while the self-leveling underlayment cures. Hardwood installationsdo require the wood to acclimate. This is always true. Moisture testing can determine what the moisture content of the wood is prior to installation. Acclamation occurs when the wood and the substrate are within 2 to 4% of each other. When the slab has high moisture, the base boards and the casings can be checked to determine acclimation. Over time, the moisture content of the wood will match that of the room. Note that exotic species of solid wood flooring may require longer acclimation periods. Installing very damp wood can lead to separation, and installing very dry wood can lead to tenting or cracking of the wood. Once the floor is flat and the wood flooring is acclimated, it’s time to get installing. So, if you are totally confused, need help and just want us to come out, pick up the phone right now. Please, give us a call. The more you plan for, and make preparations for the right wood, location, adhesive, testing and more you do, the better off you will be in keeping the beauty of the wood consistant over the life of the floor. It’s your investment and we want to make sure you understand all the ins and outs before you begin the installation of a hardwood floor process.